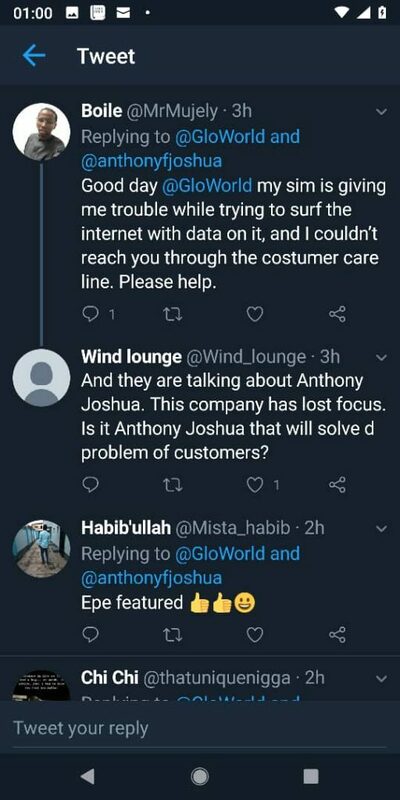 A moment of triumph for telecommunications giant, Globacom Limited, should turn into an instant for introspection as several subscribers trolled the company over its poor services on the same Twitter announcement of a new partnership with world heavyweight boxing champion Anthony Joshua on February 1. Several of the company’s subscribers used the opportunity of Joshua’s one-minute video announcement to protest poor data services. 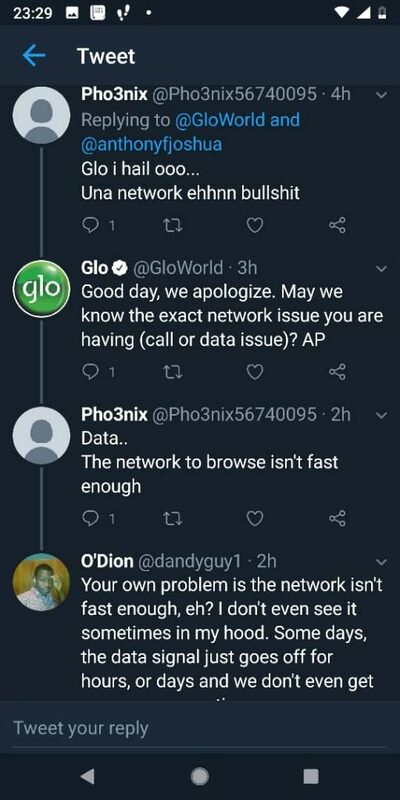 The @GloWorld account tried to keep up by responding to the issues but it was clearly overwhelmed by the discontent. 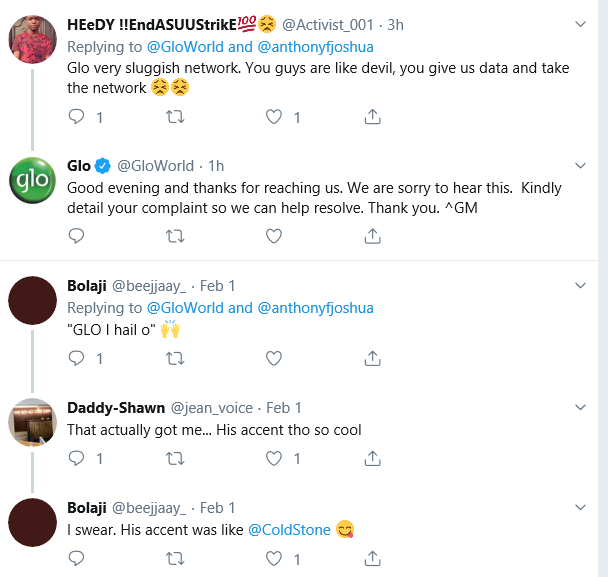 Glo became the first Nigerian company to sign Joshua as brand ambassador after the 29-year-old’s magnificent feat of holding four world heavyweight titles at the same time. Joshua, born to Nigerian parents in Watford, England, won a gold medal in boxing for Great Britain at the London 2012 Olympic Games. However, he continues to show his love for Nigeria with a famous tattoo of the African continent and his ancestral homeland clearly outlined on his shoulder. “I can’t carry these heavyweight titles by myself, there’s always got to be someone in my corner. That’s why I believe in Glo. We have that same tenacity, that Nigerian fighting spirit that makes us game changers,” Joshua said in the commercial. “You have to think deep to be a world champion. We Nigerians, yeah we know all about that. Glo, I hail o!” he concluded in Pidgin. 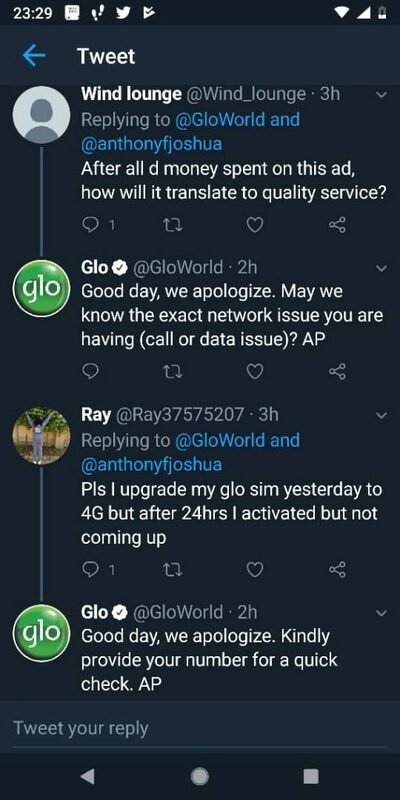 However, some of Glo’s subscribers are wondering why the company is spending a lot of money on this partnership when it could use it to improve network offerings. It was not all complaints though as some customers also expressed their appreciation for the new ad campaign that has hit television screens, notably during the airing of the weekend’s English Premier League matches that the company sponsors. At the unveiling of the partnership, Globacom expressed plans to improve its service offering across the country to enable subscribers to have a better user experience. Mr Sanjib Roy, Group Chief Technical Director, Globacom, explained that the company is investing massively to increase its network capacity, coverage and quality of service, adding that part of the massive investment in new infrastructure is the technical upgrade of over 1200 of its cell sites. He also noted that new sites would be rolled out in rural areas to bridge the digital gap across the country. Mr Roy also stated that Globacom has concluded the swap of its legacy facilities in Lagos, Ogun and Oyo states while the swap in Edo, Delta and other states in the South West is ongoing. “We are also upgrading the IN prepaid platform and investing in a new Call Centre platform, all in a bid to give customers the most pristine experience on the Glo network”, he said. He disclosed that Globacom is also enhancing the Network capacity for data and voice to give superior quality voice and boost download speed. The company also unveiled a series of new innovative products to be launched in batches in the first quarter of 2019. The products include the Glo Health Care app, Glo Mobile Money agent network, Glo Entertainment Portal, World Connect and Glo Artificial Intelligence platform, the first of its kind in Nigeria. While it continues to be a big sponsor of the EPL and now AJ, Globacom pulled out of its title sponsorship of the elite Nigeria Professional Football League (NPFL) in 2016. It also stopped its title sponsorship of the CAF Awards in 2017 and has not used a Nigerian footballer as brand ambassador since Victor Moses in 2013 while also dropping the Super Eagles and other Nigeria national teams. Should Globacom return its focus to delivering better services and domestic sport? Leave your comments below.